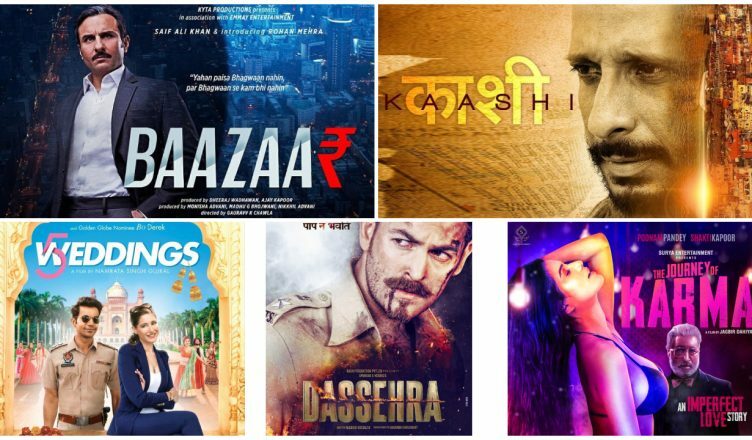 HALF A DOZEN RELEASES TOMORROW; BAAZAAR TO DOMINATE! BAAZAAR: It stars Saif Ali Khan, Chitrangda Singh and Radhika Apte and marks the debut of Vinod Mehra’s son Rohan. It is produced by Nikkhil Advani and is the directorial debut of Gauravv K Chawla. The film was ready almost a year back but didn’t get any buyers. Therefore, a perception was generated the film is poor. But after the success of Saif’s web show Sacred Games, the film again generated interest and ultimately, Viacom18 Motion Pictures came on board. When the trailer was unveiled, people were pleasantly surprised as it seemed quite interesting and entertaining. The dialogues were massy and Saif looked in great form. Rohan too seems promising while Chitrangda and Radhika seem to have an important role. Songs didn’t pick up and also, the reach would be limited as it’s about stock exchange which many don’t follow. Still, the opening can be in the range of Rs. 2.50-3.50 crore. KAASHI – IN SEARCH OF GANGA: It stars Sharman Joshi and Aishwarya Devan and is a massy thriller. The film was unknown when it was made and got noticed a bit when the trailers came out. Sharman looks in form and the film’s trailer is intriguing. However, there’s a fear that the film might get preachy and symbolic in the end which won’t be accepted by the target massy audience. The film has chances only in single screens of hinterland. 5 WEDDINGS: It stars prominent actors like Rajkummar Rao and Nargis Fakhri. Shockingly, the buzz is negligible. Agreed that it was meant to be a festival film but still, a film starring these two actors ideally should have had some awareness. The film is releasing without noise and many don’t even know it’s going to be out. The opening hence can be disastrous. DASSEHRA: This is a 5-year-old film of Neil Nitin Mukesh that’s releasing now, just like Ishqeria, which came out last month. Also starring Tina Desai, this is a cop drama with a dash of action. The film looks dated but also seems to be a timepass action flick. Few mass centres might accept this film but it’s box office prospects are dim. However, on television, it can work. THE JOURNEY OF KARMA: It stars Shakti Kapoor and hottie Poonam Pandey. The film looks disastrous from the trailers and it won’t get a lot of audiences despite the skin show. The makers were panned recently when they tried to misuse the #MeToo movement for their film’s promotion. They tried to start a rumour that Shakti Kapoor sexually harassed Poonam Pandey. But even a layman could smell that the makers were lying and hence, it never became big news and rightfully so. There are two more films releasing tomorrow like Gaon – The Village No More and Chal Jaa Bapu and they’ll all bomb on the first day itself. WHICH FILM WOULD YOU LIKE TO SEE AND WHY? DO LET ME KNOW!